To listen to this show, click here. Today’s show is all about making Just ONE Choice. Have you ever made a bad decision…one you KNEW was wrong but you did it anyway? What happened next? There is a chain of events that stems from each decision – good OR bad, right OR wrong. On this show we explored what it looks like – the consequences of just ONE sinful choice versus the blessings of just ONE right choice. Trust in the Lord with all your heart, lean not on your own understanding. 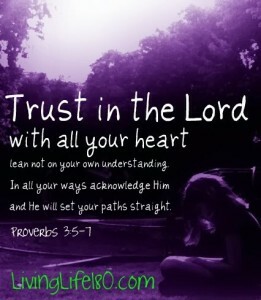 In all your ways acknowledge Him, and He will set your paths straight. Using wisdom to make choices…not according to what YOU think feels good, but according to where GOD is leading you…saves you from those SINFUL decisions and leads you towards RIGHTEOUS ones. Adam’s choice to do what he knew was wrong, but justified it because Eve did it first – consequences were severe consequences of his one wrong choice. The Israelites in the wilderness….bad choice after bad choice…cursed an entire generation! What happened BEFORE they fell into adultery that could have saved them? Maybe she could have used better judgment about bathing where she could be seen. David should have been away at war with his army but had chosen to stay behind. Had they used better judgment about these seemingly small decisions, neither would have been in the position to be placed into temptation. Of course, her choice to bathe and his choice to stay home weren’t sins…they just weren’t wise. Once they both consented into that ONE sinful choice – adultery – what happened next? He had to come up with a Plan B – and had the husband killed! Their son was born…and then died in infancy. We displease the Lord when we make those sinful choices. Living Life 180, we rest in Christ. So we are a new creation. We’re not stuck making those bad choices. And there’s a difference between sinning and Practicing Sin. 1 John 3:8-10 speaks to the difference practicing sin versus practicing righteousness. Abraham – God tested him, and he passed! Then made him the father of the nation Israel! Moses – didn’t WANT to do what God was telling him, but did it because it was RIGHT. Led the Israelites out of slavery! Joseph – maintained his integrity and made Godly choices, even though it often caused him suffering. Eventually, his integrity and choices led to being second in command over all of Egypt. Boaz – the kinsman redeemer to Ruth was a man of his word, cared for his workers and those in need, walked in integrity, and was a successful and shrewd businessman. Nothing HUGE that he did, but always doing the next one right thing! David – Yep. He messed up with Bathsheba. Fell to temptation and severely suffered…and caused others around him to suffer. BUT…prior to that he was considered a man after God’s own heart. When he messed up, he repented, he accepted his consequences (didn’t try to blame it on anyone else) and pursued Godly choices again. The sin was forgiven, but there were consequences. Trouble was in David’s household from that point forward. BUT…this was the man who was a direct ancestor to Jesus. Out of this line came the Son of God. SO…God uses us in SPITE of us! Because of His forgiveness, mercy, and grace. But that doesn’t give us license to sin!!! Stay focused on God and his word for all the answers to your life. They are THERE. When we make that WRONG choice, what happens to us? All of which lead to….more bad choices! What happens to us when we make the RIGHT choice? THIS is what living life 180 looks like!